This week I want to talk about the importance of the artwork brief. 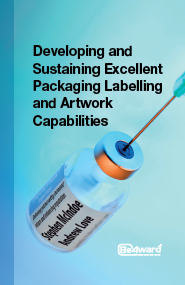 In our book ‘Developing and Sustaining Excellent Packaging, Labelling and Artwork Capabilities’ we say it is a key part a world-class process. So here I talk through why I see it as being so important, why some companies believe they don’t need one, and for those who embrace the change, the continued discipline in its use, post implementation. Events either inside or outside a company will result in the need to introduce new artwork or change existing artwork. So a ‘change’ is required. I recommend to clients, as part of their move to excellence, that the ‘change’ is defined in an artwork brief and signed off as approved by key parties before starting. A common reaction by companies is to think it unnecessary and I often get push back on the idea. They would much prefer to jump straight into designing the artwork using existing artwork as a vehicle to gather all the necessary information. They believe adding an extra step will slow the process. However by analysing their existing processes I am able to show their current way of working results in artwork going round the development cycle several times, resulting in very long lead-times, frequent omissions or errors and some very stressed staff! In reality the brief is a collection of the information required and the source documents. A good brief is a clear and concise record of the change required with no room for any misinterpretation. The marked up artwork should be amended and presented with suitable software and not done by hand, for example. An additional powerful use of the brief comes from the key stakeholders agreeing this is the change required. The signatories would need to be defined for each part of your company. This approval forms a critical control point in the process. Once a piece of artwork is produced its review and approval would be made against the artwork brief, by the same signatories, making sure all the changes required have been implemented and that no other changes have been made inadvertently. If an error is discovered with the artwork, caused by an incorrect brief, it is an important all parties realise a new artwork brief is required, with the correct information and there should be no temptation to ‘fudge’ the process. It is hard discipline to start with and it needs to be continually reinforced by the process owners, but only by forcing people to stick to the correct process will you find that your ‘right first time’ metrics improve. Reducing the number of times artwork has to go through the process will then reduce lead-times overall, as well as making them more consistent. In my next set of articles I will talk about the part played by various groups, starting with the packaging technologists/engineers.